Win a round-the-world trip worth $4,000 and meet Tim Ferriss! Win an incredible round-the-world trip worth $4,000 and meet Tim Ferriss! 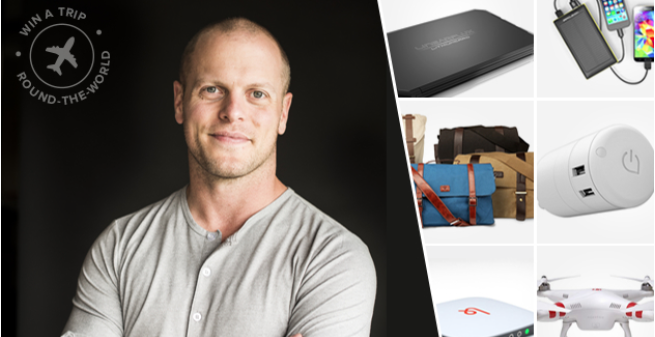 The ultimate adventure awaits in the Tim Ferriss Round-the-World Giveaway! We’re sending one insanely lucky winner around the world on an international adventure of your own choosing, mapping out a globe-trotting trek of unforgettable excitement. As if that weren’t enough of a dream come true, we’ll also set you up with a rare one-on-one session with star of The Tim Ferriss Experiment, and author of #1 New York Times Bestseller The 4-Hour Workweek, Tim Ferriss himself. If you’ve always wanted to go cliff diving in Costa Rica, horseback riding in New Zealand, grape-crushing in Tuscany or look out from Victoria Peak in Hong Kong, why not do it all in one shot? We want to take you on a trip of epic proportions—and handle the bill. All hail the DJI Phantom 2—the king of the drones and true aerial photography trailblazer. 1st Runner Up will take home a brand new DJI along with our top-selling tech essentials! Score the gadgets you need this fall—all made by top innovators, all best sellers. Power up outside with a solar battery pack, charge around the world with one plug, and carry it all in the stylish FYL Bag. To enter the Sweepstakes, complete and submit the online entry form on the contest page. You can earn additional entries when you refer a friend as well – read our official sweepstakes rules. Must be age 21 or older to enter.